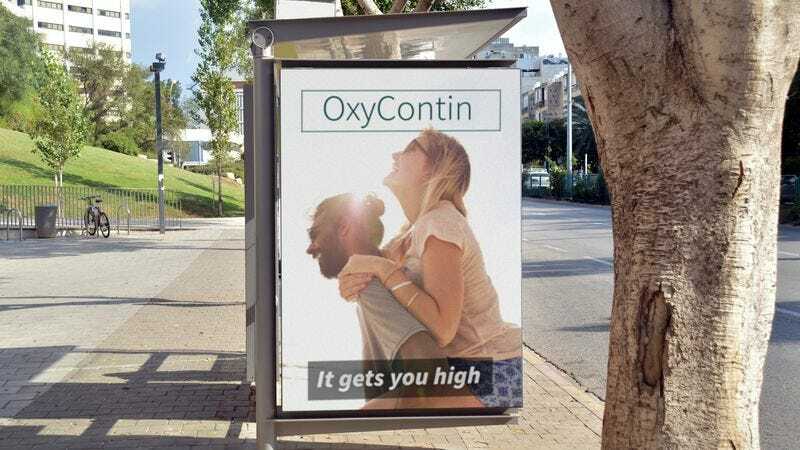 STAMFORD, CT—Caught off-guard by the shocking nationwide marketing blitz, anti-drug advocates roundly criticized Purdue Pharmaceuticals, the maker of OxyContin, for its massive new “It Gets You High” campaign. “We’re in the midst of an unprecedented opioid crisis in this country—is it really helpful to have thousands of billboards, website banners, and bus ads touting how incredible you’ll feel after just 10 milligrams?” said National Institute on Drug Abuse spokeswoman Tina Walters, adding that brightly lit billboards with slogans such as “What A Rush” and “Take More, Feel Better” represented a new low for the already grossly irresponsible drug manufacturer. “OxyContin is more than addictive enough on its own and certainly doesn’t require any assistance from television commercials that feature animated 40-mg tablets singing a catchy song about taking all the pain away or beautiful models looking into the camera and saying ‘I want an Oxy man.’” At press time, anti-drug advocates were beside themselves upon learning Purdue had just bought the naming rights for Snorting Oxy Gets You High Faster Stadium.